For the motorcycle rider, nothing beats the excitement of the road. But all too often other drivers fail to see motorcycles, or else think that they have the right of way no matter what. The result can be a terrible accident causing severe injuries to the rider, or even death. Radloff & Radloff, P.A. helps victims of motorcycle accidents and their families obtain compensation for their injuries and losses. We are hardworking, diligent and always focused on the result. We want to maximize the compensation our clients receive. Call 866.451.3211 or contact us by e-mail to arrange for a free consultation. An attorney at our firm can discuss your situation and your prospects for obtaining compensation. We want to see you get the help you need to rebuild your life. As the saying goes, you either walk away from a motorcycle accident or you are taken away. 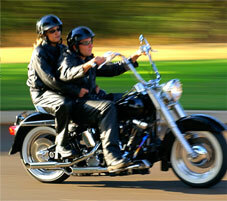 Those who suffer injuries in motorcycle accidents are almost always severely injured. Broken bones, spinal cord injuries, head injuries and brain injuries — these can require extensive medical treatment and professional long-term care. The lawyers at Radloff & Radloff, P.A. have helped many victims of motorcycle accidents in Florida obtain the financial resources they need to cope with the life-changing effects of severe injuries. To build your case for compensation, we carefully investigate all aspects of the accident and the injuries suffered by the victim. We also look at the damages from a medical point of view and the effect the injuries have on the everyday lives of the victim and family. Radloff & Radloff, P.A. will aggressively pursue compensation for you so that you can get the help you need to rebuild your life. We want to help you recover to the fullest extent possible — medically, financially and emotionally. For a free initial consultation with a motorcycle accidents lawyer at Radloff & Radloff, P.A., call 904.398.2200 or toll-free at 866.451.3211 or send us an e-mail.